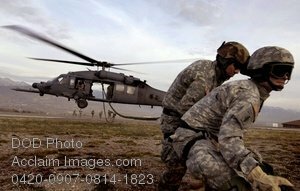 Description: Free, public domain image: Soldiers During a Search and Rescue Training Exercise with a Helicopter. Soldiers from the Utah National Guard retrieve a fast rope after being dropped into a landing zone Nov. 9 by an HH-60 Pave Hawk during a combat search and rescue exercise Nov. 9 at Camp Williams, Utah. Airmen from the 34th Weapons Squadron at Nellis Air Force Base, Nev., led the training. (U.S. Air Force photo/Master Sgt. Kevin J. Gruenwald.